The upgrades for the new Spin 3 14-inch convertibles include an almost complete Intel Whiskey Lake CPU lineup ranging from the Pentium Gold 5405U to the Core i7-8565U, plus discrete graphics solutions up to the new GeForce MX230 GPUs. Standard RAM capacity is 8 GB, but users can add up to 24 GB, and the new notebooks come with up to 512 GB NVMe + up to 1 TB HDD storage combos. 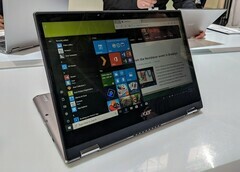 Acer’s affordable Spin 3 lineup of convertible notebooks is set to get a spec update this summer. The most notable upgrades include an almost complete Intel Whiskey Lake CPU family and discrete graphics up to the new GeForce MX230 GPU from Nvidia. The 2-in-1 notebooks from the new Spin 3 lineup come with a 14-inch HD touchscreen that can be flipped 360 degrees via the special hinge and they include a stylus, which has a special storage compartment on the side. Unfortunately, the new upgrades make the convertibles a bit bulkier, as all Spin 3 models now have a 0.8-inch thickness and weigh around 3.74 lbs. Users can choose to add up to 24 GB of DDR4 RAM, with a minimum of 8 GB. As far as storage is concerned, users may combine 128 / 256 / 512 GB NVMe SSDs with 500 GB / 1 TB HDDs. Besides the top of the line i7-8565U CPU, users can also opt for an i5-8265U, an i3-8145U, or the budget Pentium Gold 5405U CPU. Other standard features include stereo speakers, dual-band Wi-Fi + Bluetooth 5.0, HDMI out, SD card reader, 2 x USB-A ports and an audio jack. Acer plans to release the new Spin 3 models this June, with prices starting at US$500.